Registration is now open for the 24th Annual R. Wade Johnson Memorial Golf Tournament. This year the tournament will be held on Monday, July 9th. 2018. We have a morning tee time once again at the popular and convenient Andover Country Club. The easiest way to register is to visit our tournament webpage. While there, you can also check out sponsorship opportunities, which start at just $150 to sponsor a hole. 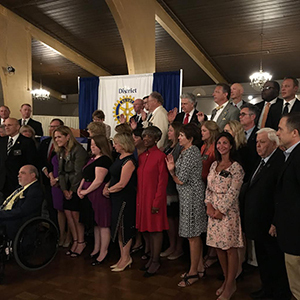 THE ROTARY CLUB OF WOBURN’S new club President Susan Hartmere was installed into office last in the last week of June along with over three dozen of her counterparts from across the Rotary district. Hosted at the Danversport Yacht Club, it was the kick-off celebration of the 2018-19 Rotary year. The celebration was attended by over 325 people, all there to recognize their local-level leaders, district advisors, and volunteers. Woburn Rotarian Jim Major was also installed as a Rotary International Assistant Governor for Rotary District 7930. Rotary District 7930 encompasses 47 Rotary Clubs in the Merrimack Valley, North Shore, Cape Ann and Greater Boston areas. A Rotary Assistant Governor is selected by the acting District Governor based on recommendations, achievements, knowledge and experience in Rotary. The primary role of an Assistant Governor is to help the local level club become more effective in areas such as service, membership, public image, and club administration. A Rotary Assistant Governor may also help a Rotary Club connect to another local area project, international service opportunity or provide guidance on accessing the programs available through the Rotary Foundation. During this Rotary Year, Major was assigned to work with the Rotary Clubs of Lexington, Melrose, Reading, and Wilmington and is one of eighteen Assistant Governors selected to serve this year. The new leadership term officially began on July 1, 2018 and Susan will serve until June 30, 2019. Woburn –based organization was chosen from a total of 597 applicants, during a competitive review process. Representing Rotary Club of Woburn, President William Sullivan and Treasurer Dan Walbourne joined 300 other guests at a reception at TradeCenter 128 in Woburn to celebrate the $10 million infusion into Greater Boston’s nonprofit sector. With the conclusion of this grant cycle, Cummings Foundation has now awarded more than $220 million to Greater Boston nonprofits alone. Utilize the Fire Safety House at all city wide events and all elementary schools in Woburn. This will teach the children how to react to smoke and fire in a safe way. The “100K for 100” program supports nonprofits that are based in and primarily serve Middlesex, Essex and Suffolk counties. Through this place-based initiative, Cummings Foundation aims to give back in the area where it owns commercial buildings, all of which are managed, at no cost to the Foundation, by its affiliate Cummings Properties. Founded in 1970 by Bill Cummings of Winchester, the Woburn-based commercial real estate firm leases and manages 11 million square feet of space, the majority of which exclusively benefits the Foundation. The Rotary Club of Woburn, established in 1924, is part of the organization of business and professional persons united worldwide who provide humanitarian service, encourage high ethical standards in all vocations and help build good will and peace in the world. The Mission of the Rotary Club of Woburn is to encourage Service as a way to address the needs of the global and local community. Woburn-based Cummings Foundation, Inc. was established in 1986 by Joyce and Bill Cummings. The Foundation directly operates its own charitable subsidiaries, including New Horizons retirement communities in Marlborough and Woburn. Bill Cummings released his self written memoir, “Starting Small and Making it Big: An Entrepreneur’s Journey to Billion-Dollar Philanthropist,” in March 2018. Additional information is available at www.CummingsFoundation.org and cummings.com/book. TWO WEEKS AGO, The Secretary of Housing and Economic Development Jay Ash urged Woburn students at our Student Government Day dinner to be resolute, hard working, to stay the course with their government efforts and to be ready to meet the long-range challenges of life and the business world. “It’s great to see all of you students so involved in government and some of you may end up in public service,” he remarked at the start. The luncheon was sponsored by our Woburn Rotary Club at the Elks Hall in East Woburn. “The fact you took some time to do what did is important,” he said at the outset. He cited this fact in both public or private life whether the person goes into the public sector or the business sector. “You never know who is watching you,” he re-iterated at several junctures. Secretary Ash is responsible for directing and executing Governor Charlie Baker’s agenda on housing and community development, job creation, business development, consumer affairs, and business regulation. Since joining the Baker-Polito Administration, Secretary Ash has prioritised efforts to grow jobs, help communities realize their economic development priorities, connect citizens to new economic opportunities, and build prosperity across Massachusetts. Under Secretary Ash’s leadership, the Commonwealth has substantially increased its commitment to public infrastructure that unlocks economic development, to the revitalization of Brown fields, to workforce training equipment, and to the development and commercialisation of emerging technologies. He has led efforts to increase affordable housing production, to redevelop and modernize public housing communities, and to substantially reduce the number of homeless families sheltered in motel rooms. Secretary Ash has played a leadership role in the recruitment and expansion of major employers, including Amazon, General Electric, IBM Watson Health, Kronos, and Siemens. THE APPEARANCE of Rotary Foundation chair Liz Cullen was also a nice time to honor our member Kathy O’Doherty again! Kathy was awarded a Paul Harris Fellow Award for her commitment and service to Rotary back on January 6, 2015 and received her second such award at last week’s meeting. Kathy made a financial donation to the Rotary Foundation after having some good luck recently at a Rotary leadership luncheon. She was the president of the club in 2013-2014. Again, she was accompanied by her husband Shaheen, who really enjoys the club, our members and was all smiles and picture-taking of this second presentation. Our Foundation Chair Bill Sullivan did the honors and did review some of Kathy’s many accomplishments, including her 30 years as the Head Librarian at the Woburn Public Library - the longest in the city’s history. She has been a Rotarian since 1995. The award is Rotary Foundation’s way of saying “thanks” for her many humanitarian efforts. “In becoming a Paul Harris Fellow, Kathy joins a remarkable company of persons throughout the world, all recognized for their devotion to the ideals of goodwill, peace and understanding,” said Sullivan “This is a goal of Rotarians the world over and one I clearly share.” She was given a PaulHarris pin with one sapphire. “We heartily congratulate you and thank you for your commitment to Rotary Foundation programs,” concluded Bill Sullivan. She is currently the secretary of the club. The 2016 Woburn Rotary Holiday Party and Raffle was a great success! 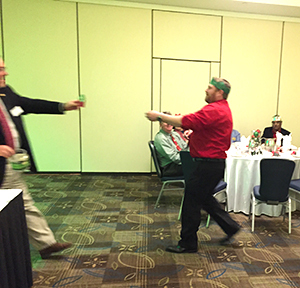 For the second year, a holiday raffle was the highlight of the club's holiday party. Club members raised over $3,000 to support our charitable work by selling $50 raffle tickets that gave people a chance to win a package of local restaurant gift certificates or the grand prize of $1,000 cash. Congrats to our own Richard Archambault for being the lucky winner of that big prize! In addition to drawing the raffle prize winners, we also enjoyed a Yankee Swap. We set a $10 limit on gifts, to concentrate resources on the raffle, and encouraged creativity. The membership certainly came through on that front! Thanks to member Susan Hartmere for initiating and leading the Yankee Swap activity. 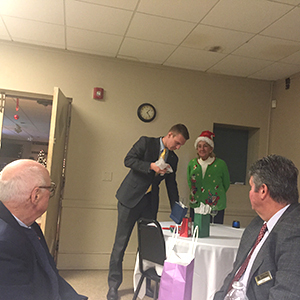 The Holiday Party was held at the Woburn Elks Lodge, which has just recently been chosen as our club's new regular meeting venue. 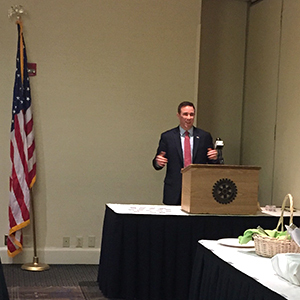 Jay Ash, Secretary for Housing and Economic Development for the Commonwealth of Massachusetts, joined our Club on October 4 to discuss the Baker Administration's economic development initiatives. He provided an upbeat assessment of the state's economic prospects and shed some insight into the workings of the Baker Administration. Secretary Ash noted that there is a strong team environment amongst the Cabinet members, and he fit right in despite his affiliation with the Democratic Party. A number of guests, including Mayor Scott Galvin and City Council President Richard Haggerty, joined club members to hear Secretary Ash speak. Mayor Galvin thanked the Secretary for the very constructive working relationship Woburn has enjoyed with him and his colleagues in the Baker Administration. Secretary Ash is responsible for directing and executing Governor Charlie Baker’s agenda on housing and community development, job creation, business development, consumer affairs, and business regulation. 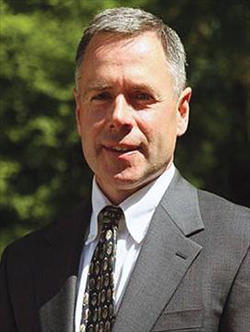 He previously served as the city manager in his native Chelsea, a position he held from 2000 to 2014. In Chelsea, Secretary Ash’s leadership produced both economic expansion and fiscal stability. Secretary Ash has led statewide initiatives on health insurance, youth violence, transportation infrastructure and expanded gaming in Massachusetts. He previously served as co-founder and vice-chair of the Metropolitan Mayors Coalition, as past president of the Metropolitan Area Planning Council, as a board member of the public policy think tank MassINC, the staff director to the Massachusetts House Majority Leader, and as an elected trustee of his alma mater, Clark University. Back to school for the Woburn Rotary Club means we get to welcome a new group of Junior Rotarians! We always look forward to meeting the wonderful students who are selected from the Interact Club for this role. This year's Junior Rotarians are Matt Burke, Matt Power and Divesh Patel (missing from photo). The two Matts were welcomed by the Club at a recent meeting along with their advisor, Devin McDonough. 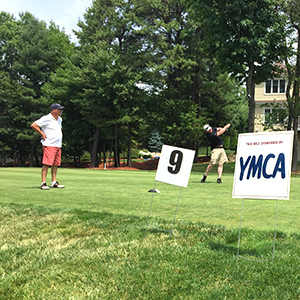 Golf Tournament a Great Success! The R.Wade Johnson Memorial Golf Tournament held on July 18, 2016, was a great success! We had strong participation from club members, friends and colleagues. 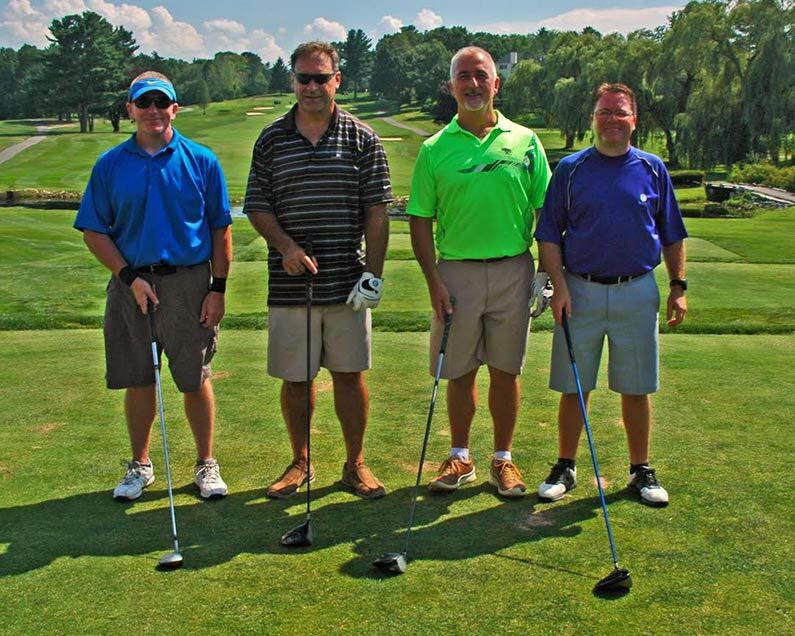 The 22nd annual tournament was held for the first time in the morning, which enabled us to enjoy our golf outing at Andover Country Club before the searing temperatures became unbearable. This was also the first time that we used the "Best Ball" format, which helped to keep play moving along nicely. At a recent meeting, Golf Committee Chair Danny Walbourne reported that the event generated gross revenue of $25,133 and a net profit of $13,608. The revenue included $10,480 from sponsors, including many regular supporters along with some new ones. The live auction brought in $1,400 and the on course fundraisers contributed $1,703 to the totals. President Janna Mazza and the Golf Committee would like to extend thanks to all of the sponsors, golfers and volunteers who made the event a success. Special thanks to the Johnson family for their continued support. See you next year! Janna Mazza was installed as our new Woburn Rotary Club President last week at the District 7930 Installation Dinner. She was joined by a table full of Woburn Rotarians at the Danversport Yacht Club who came to support her at the annual ceremony. 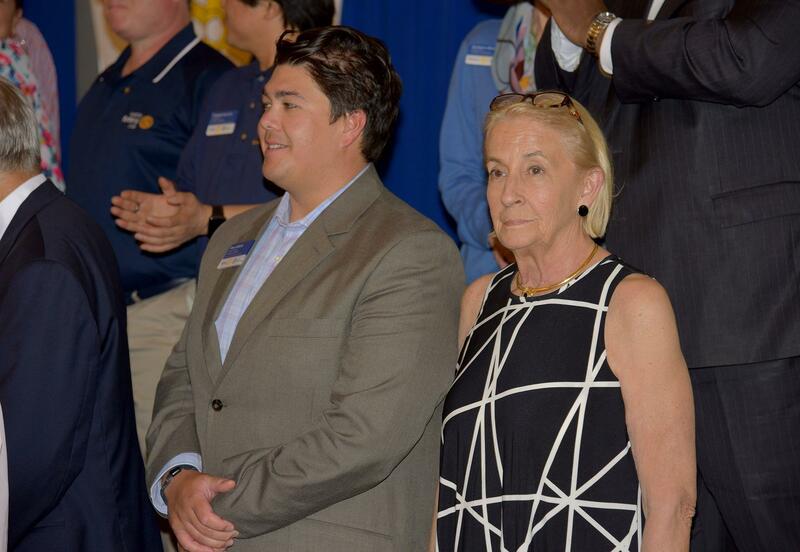 President Janna follows Dan Lannan, who served the club ably during the 2015/2016 Rotary year. Janna officially assumed the club president role as of July 1, 2016. 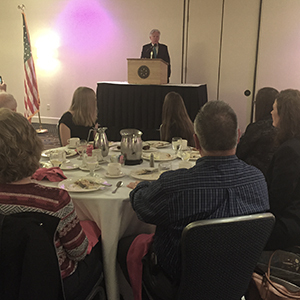 Our Rotary Club recently continued its tradition of hosting the annual Student Government Day Luncheon. UMass President Marty Meehan was on hand to serve as our keynote speaker. He offered students encouraging words about his own success, a result of setting goals, hard work and getting a good education. President Meehan was certainly a perfect speaker for Student Government Day, providing insight from his time serving in Congress. Mayor Scott Galvin joined with Meehan, along with student mayor Carlos Luiz Freitas, to provide greetings at the noontime dinner event by the Woburn Rotary Club at the Crowne Plaza’s main ballroom. The full ballroom was also greeted by Rotary Club president Daniel Lannan. On the first day, the students met their counterparts in the rotunda of City Hall and were then given an overview of the 2-day program, including a mock City Council meeting. On the second day, students joined with their counterparts in city government and went through the daily routines and job functions of each department from the police and fire chief to the city engineer and others. He was still smiling and chipper and eager to get on with his life. Sgt. Dic Donohue, a Winchester native and former North Woburn resident and MBTA Transit Police officer, came to speak to our Rotary Club on March 8. Sgt. Donahue reflected on the Boston Marathon shootings where he was nearly killed in a wild exchange of gunfire in the morning of April 19, 2013, with two brothers, whose case has received widespread publicity. Sgt. Donahue relived his post-Marathon experience when a bullet severed a femoral artery causing severe blood loss on-site in Watertown. He was given immediate lifesaving care, prolonged CPR, and received multiple blood transfusions. Today, he is walking normally … almost. To the casual observer, he is upright and has pep in his step but he will confide with others about his badly-damaged lower left leg and ankle. “It really hurts some days,” he will admit. However, learning to live life all over again has been his goal since the shooting, which required two months in the hospital for rehabilitation. “I am stronger than ever before,” he said in his talk to the club. Then came the ambulance ride and 6-8 hours of surgery. Boston, he said, is fortunate to have such high level treatment for people with gunshots wounds because they are highly-trained in treating patients. “I was basically in a coma for a couple of days,” he added, not remembering anything. “Then, I looked around, and saw all the people who had saved my life." His mind, he said, reflected on many things, including being in the police academy where such training is covered, so they quickly put their guns in the holster “and got out the aid kits to save my life.” People came bedside like his wife Kimberly Marie, his brother and a college friend, as he weathered in a lot of pain those first few days and months. At one point, he was given about a two percent chance to live. He described how he managed to pull through as a result of great care and support, and his personal resiliency. He had worked in law enforcement as a member of the MBTA Transit Police Department since 2010 and just retired a month ago. He missed 23 months of work and thereafter was promoted to the rank of Sergeant. For his actions in Watertown, he received the state’s highest law enforcement award, the George L. Hanna Medal of Honor and the department’s highest award, the MBTA Transit Police Medal of Honor. He’s also been recognized by over 20 law enforcement and civic organizations. Donohue is a graduate of the Virginia Military Institute and holds Master’s degrees from the University of Massachusetts-Lowell and the University of Limerick, Ireland. Prior to a career in law enforcement, Sgt. Donohue worked in the hospitality industry and served as an officer in the U.S. Navy. In recent days, he also works as a spokesman and board member of the American Red Cross, an organization he credits for his survival. He lives in Reading with his wife Kimberly Marie, and son. Adapted from a story that first appeared the The Hide. 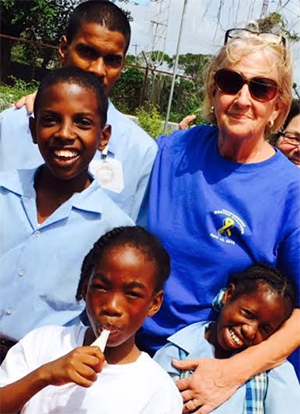 Woburn Rotarian Susan Hartmere has just recently returned from a service trip to Guyana! Susan went on this trip with Rotarians from other clubs in our district. This is one of many trips like this Susan has made. For now, we thought this would be a great picture to feature prominently on our new website. Stay tuned for more details about the trip! An opportunity exists for any area resident to take part in the Rotary Club Foundation’s World Peace Fellowships through a fully-funded Master’s Degree program. Rotary Peace Fellows become leaders and catalysts for peace and conflict resolution and many go on to careers in national governments around the world, as well as to the military, law enforcement, and international organizations like the United Nations and the World Bank. 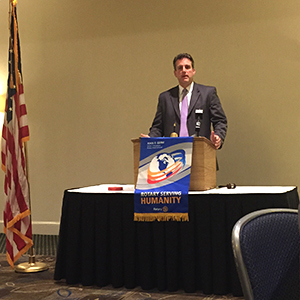 Rotarian Dennis Sweeney of the Methuen Rotary Club was a recent speaker at the Woburn Rotary Club and spread the word the Fellowships are available to just about anyone who can qualify. There are some 360 individuals who apply annually, he noted. The deadline to apply this year is May 31st. Peace Centers, he pointed out, are located in five universities worldwide and are involved in 15-24 month-long programs. The applicant, he noted, would be admitted to the program and not the university. The five universities offering the program include: Duke University and the University of North Carolina at Chapel Hill in the USA; The International Christian University, Japan; The University of Bradford, England; The University of Queensland, Australia; The Uppsala University, Sweden. A multiple Paul Harris recipient, Sweeney is a Past President of the Methuen Rotary Club and has served as a District Governor’s Aide. He mentioned there are some restrictions on the Peace Fellowships, such as as a person cannot be an active or honorary Rotary member. For more information on the Peace Fellowships, including application process, visit this page on the Rotary International site. The James L. McKeown Boys & Girls Club is forging ahead with plans to totally renovate their existing facility as the new year gets moving along. At our February 2 Club meeting, Boys & Girls Club Executive Director Julie Gage and newly-elected President Michael Donaghey, presented in detail the for an $8.5 million, total renovation at their existing building site. They reported they have crossed the $4 million dollar fundraising mark, and are actively courting additional support from the local business community. 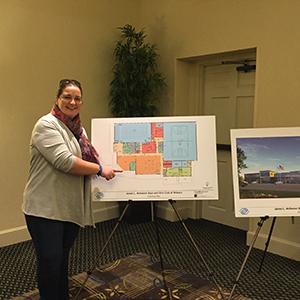 With extensive renovation plans tucked under arms, Julie talked about the 1,400 members involved in the club at their building on Charles Gardner Lane in Central Square to their four off-site facilities at city elementary schools. The service to the community, she points out, expands and contracts with the needs of school-age youngsters of the community, including pre-school programs and After School programs at schools. The list of programs on site are almost bottomless, she continued, citing everything from the expected swimming and gym routines to the highly-educational programs with computers and and other resources. For additional details of the status of the expansion plans, please visit the article that appeared in the Daily Times Chronicle. Holiday Raffle a Big Success! Our first holiday raffle was a big success! We raised $2,500 to support local charities and had a great time in the process. The primary goal of the holiday raffle was to create a new fundraising event to complement what we raise through our annual golf tournament. The fundraising committee was interested in starting with something we could act on fairly quickly, with low overhead, as we explore other creative fundraising ideas that might take more time to develop. Members sold raffle tickets that offered chances to win packages of gift certificates to local restaurants, or possibly the grand prize of $1,000 cash. One lucky winner would have a chance to put a nice dent in their Christmas expenses! The raffle was held in conjunction with our annual holiday luncheon. Buying a raffle ticket also covered one's lunch, so we were pleased to have many guests for the festive holiday meeting. While many of the tickets were purchased by club members, in a clear indication the raffle was "fair to all concerned", the grand prize went to one of Rotarian Andy Eick's colleagues. Just to make it clear things were on the up and up, the winning tickets were pulled by the Reverend Rich Clancy, who joined Mike Martini as a guest for the lunch. Not to worry, some club members managed to win some prizes. Jim Major and Danny Walbourne won the gift certificate packages. As you can see from the photo, Danny was excited! 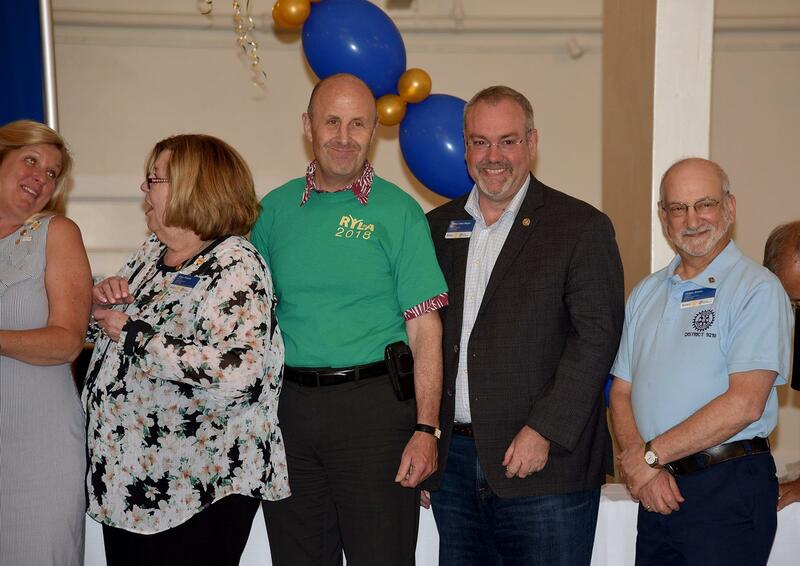 The holiday raffle was coordinated by a committee chaired by David Crowley, that also included Jack Ryan, Janna Mazza, Danny Wahlbourne, Susan Hartmere, Jim Major and President Dan Lannan. 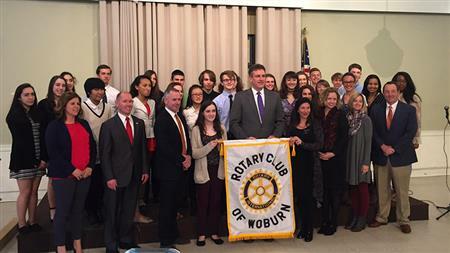 Continuing with an annual tradition, Woburn Mayor Scott Galvin will address the Rotary Club at our lunch meeting on Tuesday, Jan. 26. Come join us to hear about the state of our city, and learn about key issues and plans for 2016. 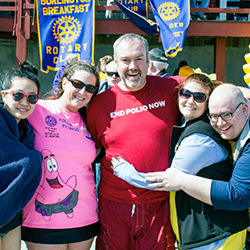 ​Woburn Rotarian Jim Major is getting ready to plunge into the icy Atlantic once again as part of the annual District 7930 Polar Plunge. Funds raised for this effort will help the Rotary Foundation eradicate polio. Local donations supporting Jim and the other intrepid Rotarians will be matched 2 to 1 by the Gates Foundation! So please visit Jim's Polar Plunge fundraising web page and donate generously!